Duluth is home to many landmarks, and its most iconic, the Aerial Lift Bridge, anchors the Zenith City’s historic hillside and dainty downtown to the greatest Great Lake, pinning the scent of freshwater waves to the soul of the city. Across the bay from the bridge along Rice’s Point stands another sort of skyline, more geometric than its neighbor, and much more quiet: Duluth’s ill-understood elevator district. In terms of physical scale, the elevators rival the ore docks. In terms of economics, they have made a far greater impact than those storied piers. Yet, strangely, these monoliths of the grain trade have received relatively little attention ever since they, to be blunt, stopped spontaneously exploding in the heart of the city. Duluth’s first grain elevator was financed in 1869 by two of the biggest names in the early history of the town: Jay Cooke, who funded the construction, and Roger Munger, whose town-building sawmill, located just down Lake Avenue, provided the lumber. The construction signaled a local economic sigh that signaled a recovery from the Panic of 1857. Cooke’s railroad (the Lake Superior & Mississippi) serviced the elevator and even added a 1,000-foot breakwater to protect loading vessels. It was designed to hold 350,000 bushels—just 20 percent the capacity of its modern counterparts—and featured steam-powered conveyors to move that grain around. Because of the natural boundary of Minnesota Point and the lack of a ship canal, the wooden crib-style structure had to extend into the unprotected harbor, near the foot of modern Fourth Avenue East. The elevator’s breakwaters were hit hard by a storm in the winter of 1872, which crippled the harbor’s defenses; they were never repaired. This precarious location would have been the future of Duluth grain were it not for the construction of the ship canal in 1871. Between that time and 1905, when the first iteration of the Aerial Lift Bridge was constructed, a ferry service moved people and goods across the primitive canal. 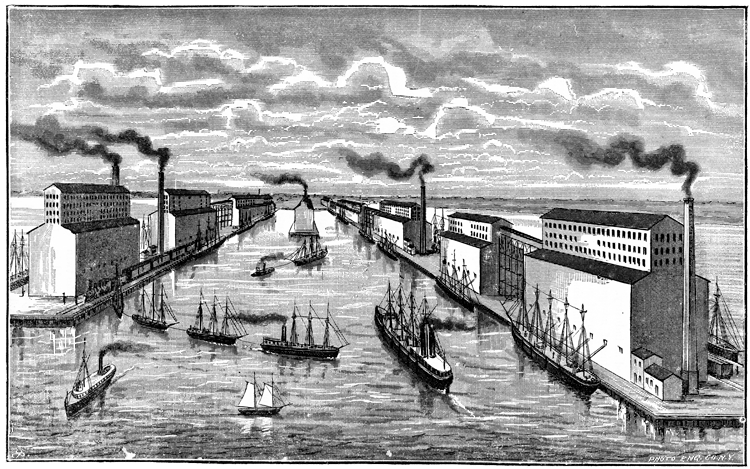 With a reliable connection between Lake Superior and a natural harbor, one ready for industry, businesses looked to Duluth as a future major national port. Lake Superior Elevator was the biggest of the early players in grain in Duluth. Its oldest elevator was “B,” built in 1880 on Rice’s Point directly across from the still-new ship canal and next to Northern Pacific’s #2 Freight House. It sat on a little-improved natural peninsula, making it an ideal location. After “B,” more elevators of the same design followed on the slip. Elevator “C” was added in 1881 and stood 125 feet over the lake. When it was rebuilt in 1888 it was clad in iron to make it more fire resistant, a strategy that would be repeated for all the wooden elevators that followed. Though the majority of the grain passed through Duluth on its way to mills, the Twin Ports had a few mills of its own, dating to the 1882 Superior Roller Mill in Wisconsin. The most impressive operation by far, though, was the Imperial Flour Mill funded by Roger Munger, Bradford T. Church, and T. A. Olmstead. This plant was complemented by two elevators, #4 and #5, to help handle its 8,000 barrel-per-day output. At the time of its construction Imperial was the largest and most technologically advanced flour mill in the world. The construction of the first Elevator “D” began in 1884. The elevator was capable of storing 1.2 million bushels and was the highest elevator in the harbor; its highest point was 140 feet over the lake, impressive for 1884 carpentry-based engineering. The following year Warehouse No. 1 was added to the shoreline, not far from a new Elevator “G,” which filled in the space between “D” and the Rice’s Point railroad tracks. Warehouses are essentially giant grain sheds, where the grain piled horizontally, as opposed to elevators, which stored grain vertically. Elevators are superior to warehouses because they can use gravity to expel grain, but they are much more expensive to construct. Union Improvement & Elevator Co.
Union began building elevators on Rice’s Point in 1885, a little south of Lake Superior’s shipping slip. Elevator “E” would be first, rising 92 feet and consisting of wood clad in iron. It would be rebuilt in 1889. Elevator “F” was built next to “E” a few hundred feet into the bay on an artificial eastward extension of the Point. The following two years would bring one more elevator each. Elevator “I” was added near the mouth of the slip in 1886 and held an impressive 1.75 million bushels in its 80-foot high bins. Elevator “H” adjoined “I” on its western side in 1887 and stood 135 feet over the lake. The wooden “I” would be replaced by a concrete silo system in 1919 bearing the same name; it still stands. Capitol’s oldest elevators, #4 and #5, were not built by Capitol at all, but by the aforementioned Imperial Mills. Imperial struggled since its construction to bring profits, but could not find success in spite of its record-breaking production rate. In 1899 it was put to auction, where it was purchased by Capitol on the condition the mill not produce or handle flour. Imperial had built two elevators, #4 and #5, which Capitol put to use. Imperial’s first elevator, the #4, rose in 1889 to the then-precarious height of 170 feet. This is less impressive as it only skirted the edges of a loading slip at the time, making it less than ideal to load ships with. Later, the slip was refined to give #4 more flexibility. Capitol, and all slips going eastward, rested on artificial protrusions from Rice’s Point, unlike Lake Superior Elevator, which relied upon existing geographical features. Very close to #4—dangerously close, in fire prevention terms—followed Imperial #5, built to a more reasonable height of 90 feet and farther down the slip, right beside the Imperial Mill. So near, in fact, that both Imperial, then Capitol, used steam from the flour mill’s boilers to operate the elevators, a practice that continued after the flour mill was closed due to consolidation and the mill became Minnesota Mining & Manufacturing’s first sandpaper plant. In November 1886, the company was in the process of finishing the construction of Elevator “Q” adjacent to “A” when a light bulb exploded in “A,” turning the wooden, dusty guts of the elevator into an unstoppable inferno. Grain dust is extremely flammable, and dust fires are difficult to battle. Soon, the fire had spread to “Q” which was immediately engulfed. No known images exist of “Q,” but it is highly likely that it had not yet been shielded in corrugated iron when the fire began. Flames spread from the old elevator’s cupola—the raised hallway on top of the structure where grain is directed into bins—down the sides of the elevator, burning through the walls instantly. Burning grain rained onto the street, trestle, and into Lake Superior. The town gathered to watch as two-dozen firefighters entered the flaming buildings, equipped only with hoses and buckets. When it was clear that the battle against the blaze was in vain, and that it was wiser to withhold the men in case the blaze threatened to spread downtown, the men were recalled. During evacuation, three men passed out from the smoke and heat and were consumed by the fire. One found himself trapped by the flames in the unfinished cupola of “Q” and, rather than being burned alive, leapt to his death. Additional to the death toll, the loss of 500,000 bushels in the elevators proved enough to trigger a rise in the Chicago grain market. Rather than being sold to mills, what did not burn was left to rot, eventually being sent out by barge to the middle of the lake and dumped. 1891 the building’s ruins were turned into a temporary, makeshift curling rink for the Duluth Curling Club before they were eventually demolished. The loss of life and the elevator motivated Duluth to build safer elevators, and was perhaps another reason all subsequent elevators were built on Rice’s Point—far from downtown. It is possible that the Zenith City looked toward its principal rivals and their history with fire: Chicago’s Great Fire in 1871 killed hundreds and erased a swatch of its footprint, and a grain explosion in 1878 destroyed several square blocks of the milling district there and killed 18. One thing was sure, there had to be a better construction material than wood. In the late 1880s a giant surge of grain began to hit Duluth from the Red River Valley, dramatically increasing the demand for new, fireproof facilities in Duluth. Then came Peavey. Story by Dan Turner. Originally published on Zenith City Online (2012–2017). Click here for more stories by Dan Turner. Or, visit Dan's website, http://substreet.org/.